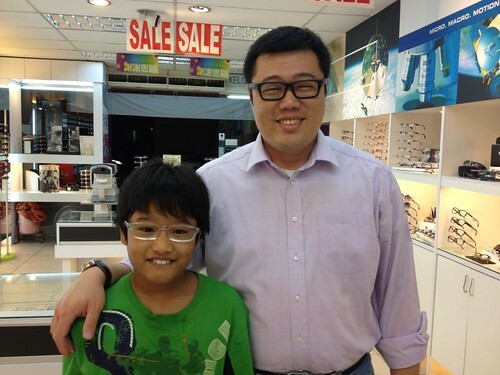 Four Eyes, again – 嗨！வணக்கம்! After our yearly eyes examination, I have been told to wear the glasses when I am driving as well as working in front of computers. I used to wear the glasses few years ago, until I thought I have a better a vision after attending a sermon by then Pastor Daniel Singh, when he said, “Be healed, in Jesus’ name.” I regained my clear vision. I used to have mild short sighted, anyway, the power has increased. Maybe Apple needs to look into inventing screen that will enhance vision, instead of deteriorating it. Thanks to Retna for choosing this frame for me. Elijah also got himself a new pair of glasses. His previous set was grabbed and broken by Inez during one of the brother-sister fight.